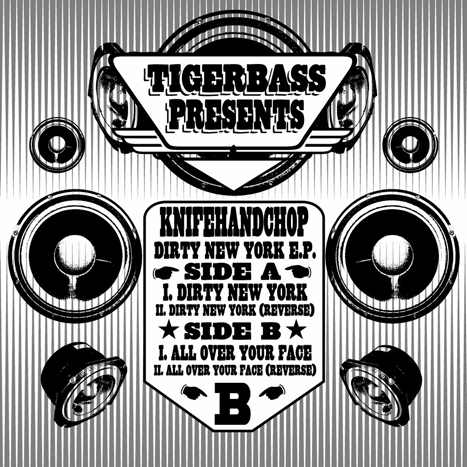 With the resurgence of booty-bass at maximum volume thanks to the Hollertronix crew and Spank Rock, Kid606's Tigerbeat6 label have decided that now is the time to enter the fray - with Knifehandchop plundering the vaults of DJ Assault for some mucky-mouthed low-end action. Ouch! Throbbing with an unhealthy disposition, Knifehandchop opens the sleaze fest with a fizzing chunk of grumbling beat mongering ('Dirty New York'); wherein the bass sweats, rhythms slouch and some soapsuds vocals bring it all down to the gutter. Backed by the frantic 'All Over Your Face' and a couple of grimy retools, Knifehandchop have slowed it down and moved away from the mentalism - leaving a satisfying slab of low-slung business in its wake. Smashbangwallop!